Campus and community leaders and supporters gathered at the Fullerton Arboretum Oct. 21 for the long-anticipated groundbreaking of the visitors center, scheduled to debut August 2005. 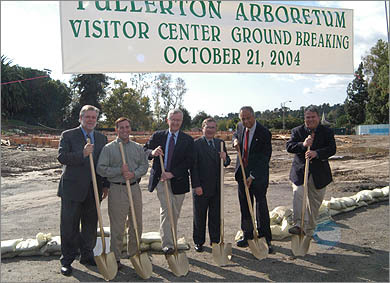 Among those taking part in the groundbreaking ceremony were, from left, Harry L. Norman, dean of University Extended Education; Mike Clesceri, mayor of Fullerton; Jim Kilponen, president of the Friends of the Fullerton Arboretum; Ephraim P. Smith, vice president for Academic Affairs; CSUF President Milton A. Gordon; and Gregory T. Dyment, direcotr of the Fullerton Arboretum. Program advocates partnerships between colleges and middle schools in low-income communities to help raise expectations and ensure successful college entry. More than a dozen CLE members participate as ushers at varous athletics events. Former children center expands focus on families and the elderly. Program will focus on the current legislative agenda proposed by the California Senior Legislature, as well as the California Master Plan on Aging presented by the California Commission on Aging. Briefing will also be a venue for showcasing activities of the Orange County Office on Aging. Games & Recreation, located in the Titan Student Union at Cal State Fullerton, is offering the “Have a Ball” youth bowling league open to children ages 4 to 16. Muslim scholars from Afghanistan, Pakistan and Bangladesh to arrive on campus to learn more about Muslim life in Southern California. Business writing students learn firsthand about the importance of community service and how it relates to the world of business. O.C. 's companies see good business in giving back to community, according to recent survey. Several studies investigate how O.C. feels about the economy, government and recent events. Are Prevention Programs Working With Children? Researcher reviewed effectiveness of drugs, alcohol and violence prevention programs on middle school youth and the found them wanting. Latino initiative received funding aimed at strengthening the educational pipeline and increasing opportunities for Latinos to enter and complete college. Campus is the latest and first in Southern California to join the emerging national scholar chapter network. University and its students generate $828.5 million of economic activity a year, according to the Economic Impact Report.